As we age our ability to regenerate new skin cells and collagen diminishes. Years of trauma to our skin leaves a lasting mark, contributing to aging factors such as scarring, pigmentation, fine lines, and overall pore size and texture. There are a wide away of effective methods to treat and rejuvenate your skin from laser based treatments, chemical peels and finally microneedling. Microneedling is a method of introducing a controlled wound into the skin triggering a release of natural growth factors, new collagen & elastin. 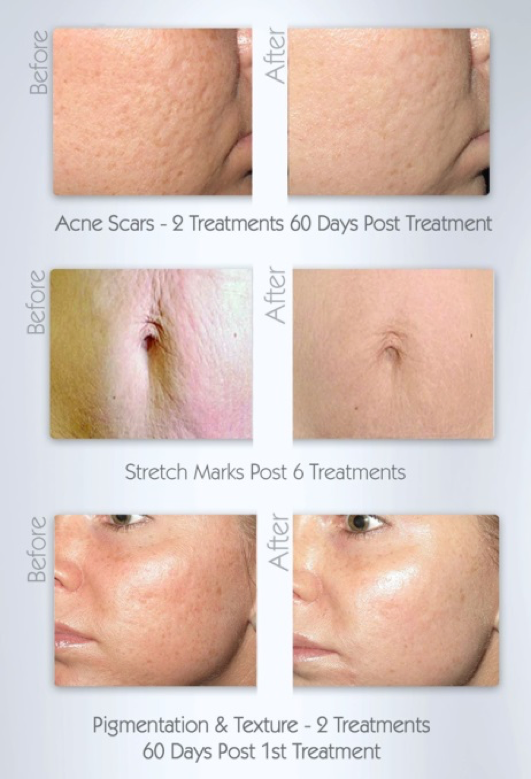 Microneedling’s benefits are many, including the fact that this process causes much less damage to the epidermis than dermal rolling and other ablative treatments, which helps to protect the new skin cell growth providing for quicker healing and a much higher success rate for overall and longer lasting results. “Needle facial treatment”, as it is sometimes called, is something we are very proud to offer at Xanadu. WHAT IS AUTOMATED MICRONEEDLING AND THE COLLAGEN PIN? Automated Micro-Needling (also known as Percutaneous Collagen Induction Therapy or PCIT) is a new innovation in aesthetic medicine for the treatment of fine lines, acne scars and improvement of the skin’s overall appearance. During procedure, tiny needles are used to create controlled micro-injuries to the skin in order to produce collagen and elastin. A topical serum is also applied to clean skin (in most cases your practitioner will use a hyaluronic acid) this soothing product is chosen to help the Collagen P.I.N. Safety Micro-needle Cartridge glide smoothly across the skin’s surface while delivering the mechanical injury necessary to bring about the necessary change, and simultaneously delivering Hyaluronic Acid (HA) – the building blocks for healthy new skin – deep into the skin. The skin’s repair process results in a thicker dermis with the appearance of softer wrinkles. Automated micro-needling also creates superficial micro-channels which allow topical serums, and creams to be absorbed more effectively into the skin. As such, it can be considered an acne scar treatment that has proven to be quite effective. Micro-needling rollers are the previous generation of needling devices. One of the many drawbacks is that dermal rollers have a fixed needle or penetration depth (i.e. 0.5mm) which is not very conducive when treating an area like the face which requires different depths due to the thickness of skin tissue, which varies in depth tremendously depending on the area being treated. Therefore, having a fixed-needle depth or penetration level is a huge drawback when trying to customize a treatment for consistency. Collagen P.I.N.™ has an adjustable needle depth that allows your skincare provider to vary the depth of penetration throughout the entire treatment. This will allow the medical provider to properly address the specific needs of thinner skin on your lower eyelids, crow’s feet, and forehead. Additionally where the tissue is thicker in other areas like the upper lip, cheeks (due to fat pads), neck, and décolletage, the necessary adjustments can easily be treated with 1 needle tip instead of 5 or 6 needle rollers. When you arrive your skin will be cleansed and a topic anesthetic will be applied 30 minutes prior to your treatment. Your anesthetic will then be removed and your skin will be cleansed again to make sure there is nothing on your skin prior to treatment. A sterile needle-tip containing 36 tiny micro-needles is attached to the Collagen P.I.N. Your skincare professional will apply a thin layer of topical Hyaluronic serum to your skin and select the appropriate treatment depth based on your unique needs. Next, in a single motion, the Collagen P.I.N. will be gently glided across the skin in one direction until the entire treatment area has been covered. This results in thousands of microscopic channels throughout the entire treatment area. The repair process, Collagen Induction Therapy, begins almost immediately. Fibroblasts – the cells that synthesize new collagen – are active for up to as much as one year after just one Collagen P.I.N. treatment. Depending on your specific needs additional serums may be added. 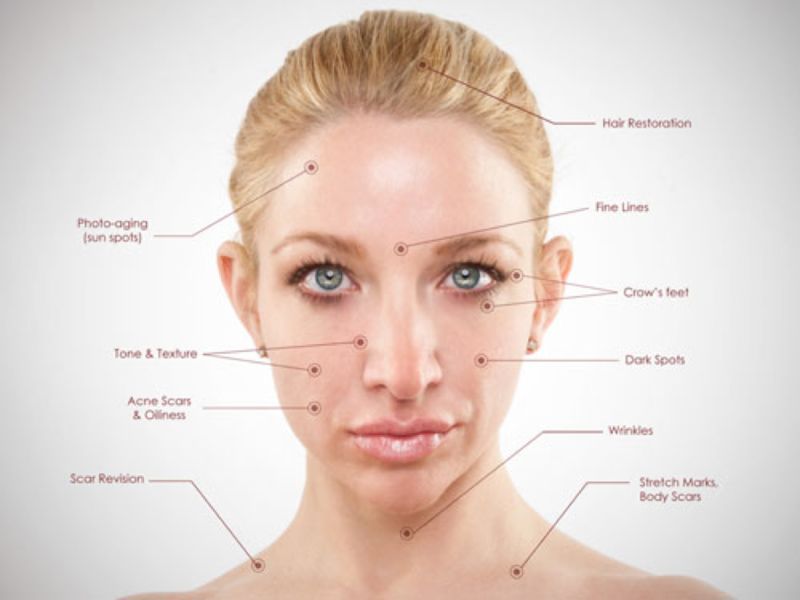 Your practitioner will select the appropriate needle depth and number of passes required to properly treat your concerns based upon your individual skin health and skin regimen. If you are interested in receiving Collagen PIN treatment or microneedling in Fort Collins, come see us at Xanadu Med Spa. Many skin imperfections that have been treated with lasers or IPL in the past can be addressed with Platelet Rich Plasma (PRP) and skin needling treatments. Sometimes called a “Vampire” Facelift, these treatments are non-ablative and are a safe, effective tool in an anti-aging skin care regimen for any skin type. PRP is like liquid gold when it comes to stimulating the skin to make collagen and elastin, tightening and rejuvenating the skin. We offer PRP as an optional add-on to the Collagen PIN treatment. The Collagen PIN rapidly creates a pattern of micro channels in the treatment area. These micro channels allow the growth factors in PRP to stimulate the production of collagen and elastin to leave the skin smoother, fresher, and more uniform. Micro channels also enhance the skin’s ability to absorb medical grade topicals, like anti-aging serums and skin lighteners, when applied during or immediately after the treatment. Patients will experience redness and blotchiness for 2–3 days after the “Vampire” Facial; after a week, they will experience some dryness and sloughing of the skin. We recommend clients apply a mineral sunblock in the days after the treatment and should schedule the PRP (“Vampire”) Facial 7–10 days before any special event. There are no known side effects. You will continue to see improvements in your skin for 2–3 months, most noticeably in injected areas, and results last for 1–2 years. You will likely need periodic maintenance treatments. The effects of the PRP (“Vampire”) Facial are there to stay and yours to keep! 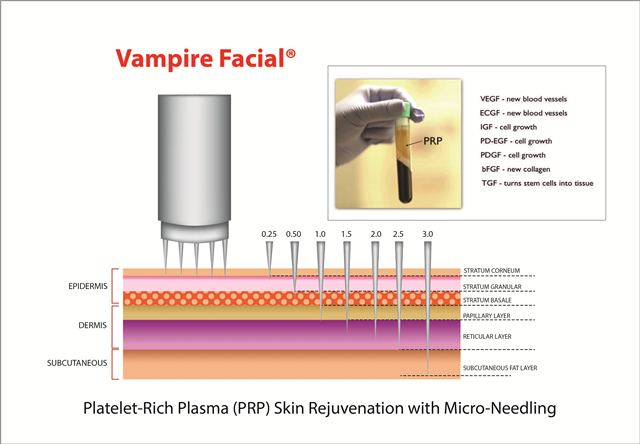 We generally recommend a package of three PRP (“Vampire”) Facials. If you are looking for a general collagen boost, you can schedule one facial quarterly. If you are seeking to treat an acne scar or want your skin to look its best for an important event, schedule a Vampire Facial once a month for 3–5 treatments and then discuss an annual maintenance schedule.